Tim Burton’s Alice in Wonderland is poised to win this weekend’s box office crown again, after breaking records with its $116 million opening last weekend. Its 47% drop-off is less than one might expect and leaves it with an estimated $62 million in earnings domestically. But it won’t have the staying power of Avatar. Its success has largely to do with the fact that children’s entertainment always makes a lot of money (even though Alice in Wonderland isn’t really a children’s film), and that it replaced Avatar in theatres when there was still a lot of excitement about 3D and IMAX. But Alice in Wonderland has gotten decidedly mixed reviews, and for good reason. It makes a mess of Lewis Carroll’s brilliant books Alice's Adventures in Wonderland and Through the Looking-Glass, and What Alice Found There. It adds silly plotlines in both the “real world” and in Wonderland in an attempt to give the story more cohesion and narrative drive. Even then, it fails because it doesn’t “raise the stakes” as writers like to say. There isn’t enough reason to care what happens next or what choices Alice makes, so it ends up feeling longer than Avatar even though is almost an hour shorter. As for the visuals, they are interesting yet underwhelming. They convey the story adequately, but never quite seem as magical as they should. Certainly, the 3D wasn’t anywhere close to Avatar, and I was not surprised to discover later that the movie was filmed in regular 2D and given simulated 3D after the fact. In a number of scenes, I removed my 3D glasses and discerned little or no difference without them. What makes the film enjoyable is the acting. 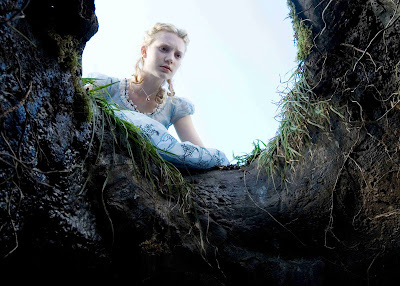 Although Mia Wasikowska is merely adequate in the lead role of Alice, the supporting cast makes the movie come alive. Johnny Depp is of course a Tim Burton mainstay and is always good if not great. But the British actors shine in their loopiness, especially Stephen Fry as the Cheshire Cat and Alan Rickman as Absolem the Blue Caterpillar. Reuniting with Depp is Burton’s partner of nine years, Helena Bonham Carter. This is their fourth movie together, all directed by Burton. In their last film, the outstanding musical Sweeney Todd: The Demon Barber of Fleet Street, it became creepily apparent how similar the two of them looked (I’m not sure what that says about Burton that his favourite actor and partner look alike), but fortunately this time Depp is given a wig and weird eyes, whereas Carter is distorted all out of proportion with a massive forehead. 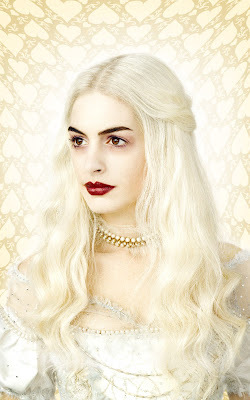 She has great fun with her villainous role, the Red Queen. I should add that Crispin Glover is well on his way to making a comeback with his turn as the Red Queen's henchman, Stayne – Knave of Hearts. He also has a good supporting role in the upcoming comedy Hot Tub Time Machine. The key to enjoying this film is to manage your expectations. That’s actually true of all films, but especially so this time. While Alice in Wonderland benefits financially from the afterglow of Avatar, it suffers in comparison to it. Its an enjoyable film, but not much more.